Although the concept of beauty is based on individual perspective (beauty is in the eye of the beholder), a sporty and fit body almost always looks attractive in the eyes of society. If you’re looking to achieve such a body, there’s no better tool to get the job done than a regular exercise routine. The problem is that the fast-paced rhythm of our daily lives leaves little time for fitness and sports. Because of this, the only way to achieve our fitness goals for many of us is to start training at home. While training at home sounds glamorous to many, it also comes with its share of caveats, but it’s not that hard if you stick to a few important rules along your journey. Let’s take a look at some of those rules, shall we?! The first thing you should, notably if you are a beginner, is to learn how to perform exercises correctly. You will also want to come up with a routine to start, and from there you can change up the routine from time to time. Starting out as a beginner can be a difficult task because you can’t rely on a personal coach to point out your mistakes. If you’re not sure whether you are performing the exercises correctly, I highly recommend you Google a couple of video guides or hire an in-home trainer for a few sessions to show you proper exercise form and hand off an effective routine for you. You should stick to these guides even after you figure out all the techniques if possible, but as you learn you will likely start creating your own routine. Make sure that all your muscles are involved as full body workouts are great, especially for those of us on a time crunch and who are looking to maximize our results. Some people who do workouts at home focus on problem areas only, forgetting about training other muscle groups. This approach is not ideal – you need to keep all your body working. There’s no need to buy a whole bunch of different fitness equipment right away once you decide to do fitness at home. 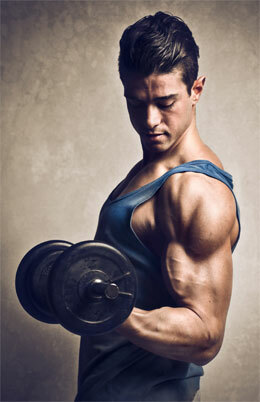 Get a pair of dumbbells first – this should be enough because you can also utilize bodyweight exercises. Prepare a place where you can do workouts safely. There should be enough room for doing push-ups, cardio-training, jumping, and other exercises. Another problem you’ll have to face is the regularity of workouts. While a gym membership can serve as a source of motivation for you, making yourself work at home can be quite difficult. First of all, you need to make a convenient schedule. Workouts won’t take much of your time: 40-60 minutes a day will be enough. Define what time of the day suits best for you. Once you begin training, it’s important that you stick to the schedule no matter what. You need to get used to the rhythm to turn your new lifestyle into a habit. Keep in mind that an intensive workout brings best results only during the first half of the day because, at this time, the body is much more active and still full of energy. If you can find enough time for exercises only in the evening, make sure that your workout ends at least two or three hours before you go to bed. To give your body enough rest, do the exercises every other day. Your training plan should look like this: warm-up (about 5 minutes), cardio (10-15 minutes), strength exercises (20 minutes), and stretching (5-8 minutes). Never skip the warm-up and stretching. They will help you smoothly switch to more difficult exercises, avoid injuries, reduce fatigue during exercise, and reduce the pain in the muscles after the workout. Fitness training can be either complex or aimed at strengthening certain muscles. The optimal plan should include both types, so you need to switch between them from time to time. For instance, devote half of the month to complex workouts and spend the other half focused on certain muscle groups. Don’t forget to always ventilate the room before you start exercising. During the workout, the air in the room should be clean, fresh, and slightly cool. You can also turn the music on or do exercises in complete silence if you want. Home workout is much cheaper than the gym, and not only because of membership fees. Many fitness centers have their own spa salons and phyto-bars, tempting you to spend extra on some cocktail or massage you don’t need. There will be no such temptation at home. Exercising at home, you decide how long your workout lasts and set the rhythm yourself. Besides, you can choose different training programs, as well as combine them at your own discretion. This is very convenient: this way your training program won’t be monotonous, and you can add something new to it every day. Those, who have a gym at home, don’t need to go to the other end of the city, wasting their precious time. You can work out at home at any time: before work, after work, in the evening, and even at night. The coach’s schedule won’t affect your workouts. – Group training is more effective. It’s much easier to work out in the company of like-minded people, who are united by one goal. For more effective training, you still need the advice and supervision of an experienced coach. – You have to fight your laziness. Full freedom of action negatively affects motivation. – You won’t be pushing yourself to the limits. You control the time of training and workload, so if you lack the willpower and loyalty to yourself, your workouts may not be effective enough. Don’t forget that the effectiveness of your workout will depend a lot on your diet and lifestyle. Don’t wait for instant results and don’t exhaust your body in the hope of getting these results faster. Muscles are formed not only during exercises but also when you’re resting.